These high capacity, high speed self-contained external hard drives connect to your PC using a USB 3.0 cable (no separate power supply is needed) and are a great way to transfer files to another PC or make backups of your valuable data. 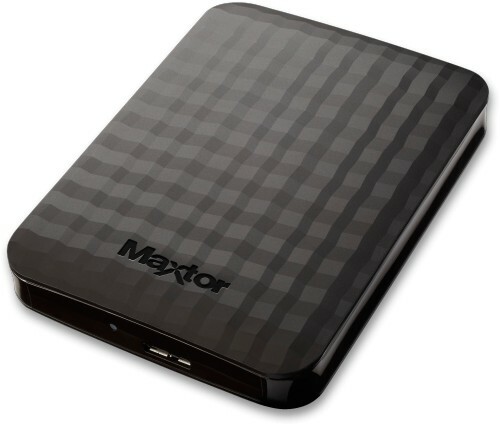 The Seagate Maxtor Portable Series External Hard Drive is a high-performance external hard drive that supports USB 2.0 and USB 3.0. Unlike conventional desktop disk drives, the Portable Series drive makes it possible for you to instantaneously add greater storage capacity to your system without having to take the computer apart. The drive comes fully partitioned and pre-formatted in NTFS format so you can instantly access the drive by simply plugging it into your computer through a USB port. The drive has a small blue light on it to indicate successful PC connection and the light flashes when data on the drive is being accessed. Although the drive can be used without the need for any additional software, it comes with AutoBackup a personal backup solution, Secure Drive for worry-free data security and SecretZone which allows user to encrypt data on the device. The drive has a black chequered and textured finish on the top surface and is piano black gloss around the sides. It has a durable matt black underside with four rubber feet for stability and acoustic insulation. A USB 3.0 cable is included. Because it uses a 2.5 inch (laptop-sized) hard drive inside the enclosure, its dimensions are small, it operates quietly, robustly and remains cool to the touch during operation. The drive will work perfectly well if it is connected to a USB 2.0 port on your PC, but it will transfer data around ten times more quickly if a USB 3.0 port is used instead.